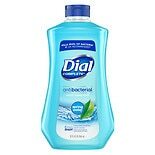 Shop Dial Antibacterial Liquid Hand Soap Refill Spring Water (32 oz. )32 oz. 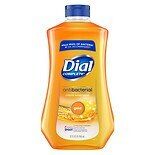 Shop Dial Gold Liquid Antibacterial Hand Soap Refill (32 oz. )32 oz. 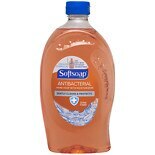 Shop Softsoap Antibacterial Hand Soap with Moisturizers Refill Crisp Clean (32 oz. )32 oz. Don't run out of your favorite germ-fighting hand soap -- simply keep antibacterial hand soap refills in your scent or color on hand. You can worry less about keeping your kitchen or bathroom stocked with the large-sized liquid soap refills available. 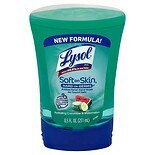 Choose your antibacterial hand soap refills from brands Softsoap, Lysol and more here at Walgreens.com. 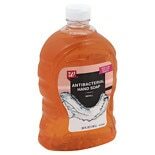 Help keep your hands healthy and clean with antibacterial liquid hand soap. Most liquid hand soaps can eliminate bacteria, but can also moisturize as they cleanse. There are many fragrances, sizes and colors to choose from, whether the scent is most important or you'd like a color match for your bathroom or kitchen d?cor. Also browse the selection of dishwashing detergents, kitchen cleaners and all purpose cleaners to help keep your home clean and germ-free. You can choose a dishwashing liquid that is strong enough for washing dishes but mild on your hands. And when you're out and about or don't have time for soap and water, choose an instant hand sanitizer or disinfectant wipes to help eliminate germs anywhere, anytime.